What intrigued me about this recipe is it’s slow-cooked. Salmon cooked in a 250-degree oven, a bit different from the 450-degree oven I used for my latest salmon creation. The ingredient list is a long one, I’d leave out the Kosher salt and the capers, which are high in salt. If you want to splurge with capers, use less, maybe a teaspoon instead of two tablespoons. 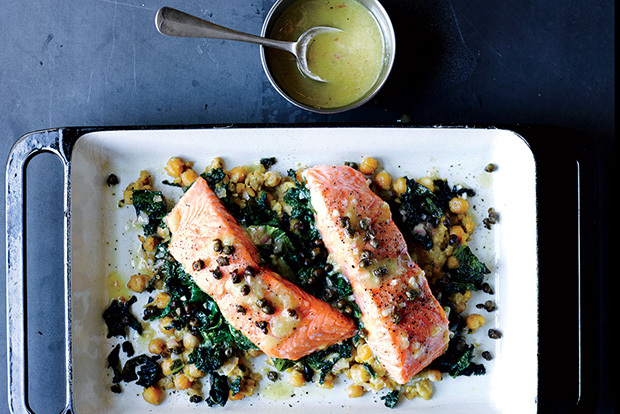 The recipe says slow-bake the salmon 30-35 minutes. The presence of chickpeas and the variety of flavors in this intrigued me, I’ll have to try it and report back to you.